OmniTrader allows you to create an unlimited number of paper trading accounts so you can practice trading with the software with no risk. Our paper accounts will mimic actual trading by including commission charges for each security type, tax implications and margin. You can view, edit and create paper trading accounts in our portfolio feature. Check on your open positions, see your position history, and add to your account with just a few clicks. OmniTrader’s paper trading capability will prepare you to take your trading to the real market. While paper trading allows you to practice trading in the current market, many traders want more practice by trading on historical data. This is where OmniTrader shines. OmniTrader delivers advanced trading simulators to let you practice trading any market – intraday or after hours. Easily step through years of data as OmniTrader analyzes the market exactly as it would have on that day. There is no forward look by any of the analysis tools in the software, so you are honing your skills just like you had been trading the markets for years. Ready to take your trading to the real market? OmniTrader offers you the ability to trade directly from your charts with any of our supported brokers. 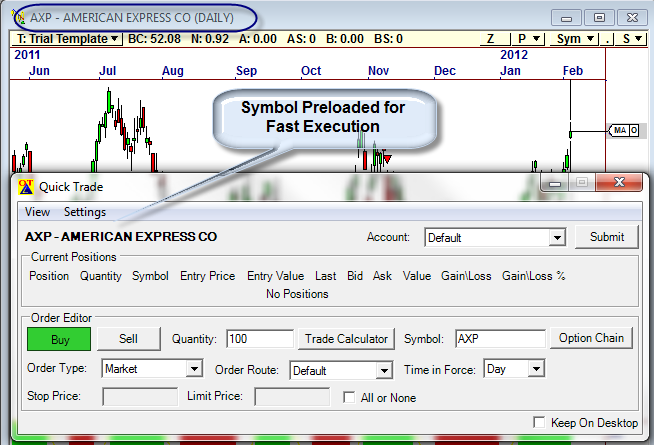 Simply click on the Trade icon, and the quick trade interface is presented – preloaded with the symbol that you are currently charting. Once you’ve entered a trade, you can manage your position in the charts as well. Place a loss stop at an exact chart level, or determine where on your chart you are going add to your position. OmniTrader even includes “virtual” orders which allow your trade to be managed on your computer – and hiding your orders from the rest of the market! OmniTrader’s integrated brokerage tools give you a unique trading advantage.